What lies ahead for Hrithik Roshan and his latest film Bang Bang? An uphill road or a smoother path? What lies ahead for Hrithik Roshan and his latest film Bang Bang? Finds out Ganesha. The ace dancing super star and the Greek God of the Hindi film industry, Hrithik Roshan captured minds and hearts with his first film itself. Known to be one of the most dedicated actors of Bollywood, and also the possessor of one of the best bodies in the Indian film industry, Roshan is a name to reckon with, when it comes to a great combination of talent, skill, good looks, fitness and dedication. However, despite being such a superior package, Hrithik, son of the yesteryears' actor Rakesh Roshan, has not done as many film as many of his contemporaries. Undeniably, the audiences will love to see him more on screen, but Roshan has not had a smooth life, given his health issues. He has also been quite selective in choosing just the right roles for himself. During the shooting of his latest film Bang Bang, Hrithik Roshan battled with myriad health and personal problems. Once the film Bang Bang went on the floors, health issues surfaced in Hrithik's life. He had to undergo a brain surgery, which was followed by a knee injury. It was around this time that his wife Sussanne Khan decided to part ways with him, ending their decade old relationship. While performing a stunt for a movie, Hrithik sustained a brain injury, and had to undergo a surgery in July 2013. Later on, Hrithik and Sussanne announced their formal separation - in December 2013. Hrithik famously said in an interview that once he was able to come out of the many challenges in life, the film Bang Bang was easy to do. 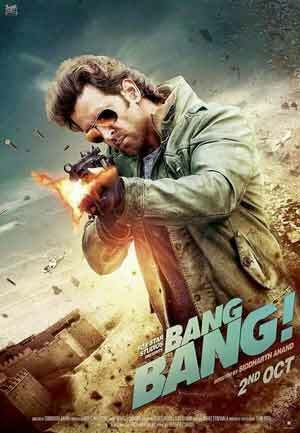 With Bang Bang, Hrithik appears in a movie after a gap of a year. He is said to have danced also, after a long gap. Will audiences love him in his latest film outing? Will stars finally relent and give Hrithik a relatively smoother life? As Bang Bang hits theatres across India on 2nd October, we take the opportunity to ask Ganesha to look at Hrithik's Charts. How will Hrithik's life pan out in the coming years? In the coming years, Hrithik is going to face ups and downs in his career, as the transiting Saturn is entering the Zodiac Sign Scorpio on 2nd November 2014. And, Saturn thence will be aspecting Hrithik's Natally retrograde Venus in Capricorn, placed with the debilitated Jupiter. 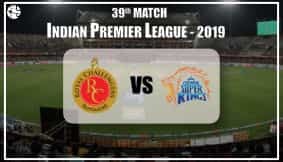 Overall, however, we shouldn't call it period of struggle for the super Roshan, but there will surely be a slow down in his career, under Saturn's influence. In the coming times, Hrithik may either become even more selective about his roles/films, or may not remain 'quantity oriented', while selecting his films, during the period of 2 ½ years starting November 2014. Thanks to Saturn's disciplinarian influence, we may see the star with golden feet being quite quality conscious in choosing his projects – be it on the silver screen or on telly. However, Ganesha feel that the period till January 2016 is going to remain quite stressful - mentally, physically or emotionally - for Hrithik and various aspects of his life. Based only on the Surya Kundali (in absence of Hrithik's reliable birth time), this reading, however, cannot be used to predict about Hrithik's love life and a possible second marriage. Nonetheless, basis the Solar Charts of both Roshan and Susanne, Ganesha doesn't see much home of the two reuniting in the near future. The two Charts are challenging enough to have led them to estrangement. Hrithik has battled numerous health problems, including very serious ones, in the past. How will be his health in the coming times? 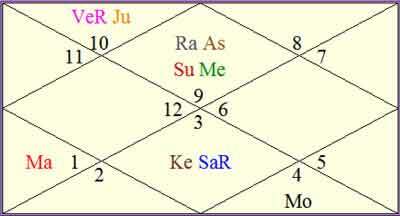 Surya-Rahu in Sagittarius indicates Grahan Dosha in Hrithik's Solar Horoscope. As Sun and Mercury are afflicted by Rahu, and Saturn is afflicted by Ketu, thus it is likely that he may keep facing health issues, even during coming times. Saturn's transit through Sagittarius (which is slated to take place in 2.5 years time from now) can be extremely crucial for his health and related matters, as Sun, Mercury and Rahu are placed in the Zodiac Sign Sagittarius in Hrithik's Chart. His film Bang Bang and his film career? Moon, Saturn and Mars' transits will be in Hrithik's favour, on the day of his latest film Bang Bang's release, but the transiting Venus, Rahu and Sun would be in Square with Hritik's Natal Sun, Mercury and Rahu. Considering these points, Ganesha feels that the film 'Bang Bang! ', said to have been inspired by Hollywood action comedy Knight and Day, may not contribute momentously to Hrithik's career. Thus, he may not benefit much as an actor from this film, even if the film goes on to be a commercial hit. We wish luck and send ahead Ganesha's blessings to Hrithik Roshan. Are Anushka Sharma and Virat Kohli really made for each other? Finds Ganesha.